Since the opening of its first hotel in 2007, Cambria Suites (cambriasuites.com), the stylish all-suite, all-new-build brand of Silver Spring, Md.-based parent company Choice Hotels International, has strategically beefed up its product offerings and charted an aggressive growth course in key urban markets with one major goal in mind -- securing a niche in the small group meetings market. Last week, while attending the 35th annual New York University International Hospitality Industry Investment Conference held at Manhattan's Marriott Marquis, hoteliers and industry watchers were buzzing about the rise of the select-service segment, which in leaner years proved extremely attractive to downscaled meeting budgets. Not surprisingly, with complimentary offerings like a hot breakfast, Wi-Fi, business center and gym use being standard fare, luxury and full-service hotels are finding it hard to woo back groups that traded down to this segment. 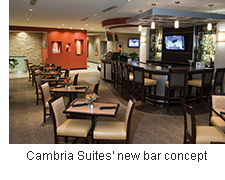 Cambria Suites, whose portfolio as of March 2013 stood at 19, has 26 properties in the development pipeline, including three in the New York City area. Two of those, in Manhattan, are scheduled to open in 2014: the 196-suite Cambria Suites Times Square and the 135-suite Cambria Suites Chelsea. With projects in Dallas, Phoenix and Rockville, Md., under way, the brand's push into urban markets is part of a targeted growth plan, says Mike Murphy, senior vice president of upscale brands, Choice Hotels International, who chatted with me at the NYU conference. A main focus of this $250 million effort, he says, is capturing more small group business. "We want to be in the 30 peak-night area. We think there is a big opportunity there for us, and we are going after it with great new products," says Murphy. Among those products are Refill, 24/7 convenience stores with organic snacks; a barista bar featuring Wolfgang Puck coffee; Refresh, a 24-hour fitness center; and new, higher-quality food and beverage offerings, which will be rolled out across all properties by year's end. "The missing link was the group F&B offering, and we have completely revamped that, so it becomes a foundation for catering to events," says Murphy. Another new feature, which will debut later this year with the opening of the 130-suite Cambria Suites in White Plains, N.Y., a major commercial hub just outside of New York City, is the creation of working pods in common spaces, where guests can work or mingle in comfortable lounge enclaves, each featuring a TV. I will be getting a sneak peek of the pods later this month, so stay tuned for an update. Omni Powers Up Its PortfolioThe chain announces some dramatic acquisitions, new-builds. Cambria Suites Delivers on ServiceHow a warm greeting trumped a cold night. Millennium Spruces Up Its Portfolio and Eyes ExpansionThe chain is shoring up key properties and eyeing new acquisitions.